With the 4th of July holiday I got a bit behind on posting these, but here is the third installment of Christmas in July. 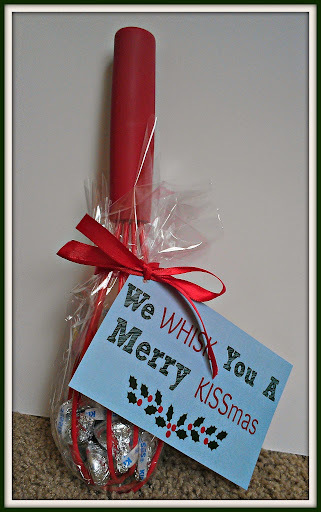 Today I wanted to share with you a cute DIY Christmas gift that pretty much anyone would love to receive. I saw this one on Pinterest and then changed it up just a bit to better match my style. They would make great holiday hostess gifts, or you could make a bunch in advance and keep them in a basket in your house for drop-in guests. Cut a piece of cellophane large enough to wrap up over the whisk and gather mid-way up the handle (or use a cellophane bag). 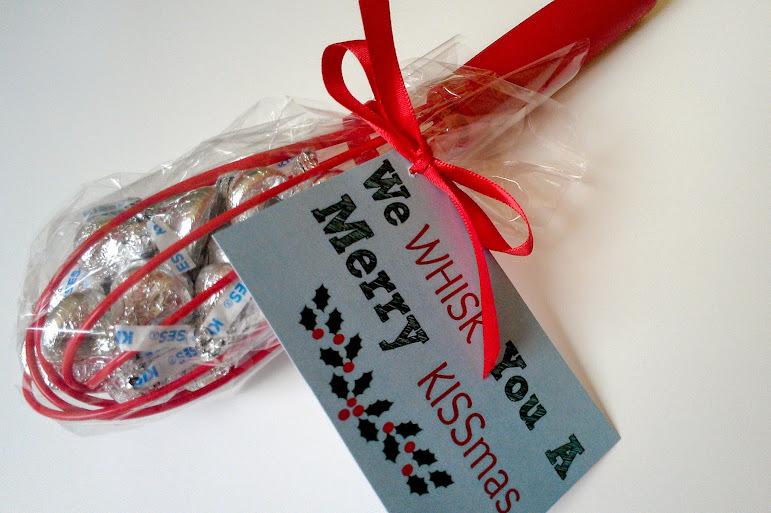 Lay the whisk on top of the cellophane and fill it with Hershey’s Kisses. I packed mine kind of full (almost half a bag) but you can put as many or as few as you’d like. Print out a package tie-on. You can create your own, or scroll down for printable versions of the ones I made. Punch a small hole in one corner. Cut a piece of ribbon long enough to wrap around the handle of the whisk and to tie into a bow. Gather the cellophane around the handle of the whisk and secure with one knot of the ribbon. Choose one end of the ribbon and thread it through the hole in the tie-on. Slide it all the way down and tie the ribbon into a bow. Easy, right? As I mentioned, you can definitely make your own tie-ons or even write them by hand. But you’re welcome to print out and use the ones I made. Just click the image below for a printable version. You may also like these Clay Pot Rudolph the Red-Nosed Reindeer Treat Cups, DIY Tile Christmas Coasters, or my Candy Cane Cookies. 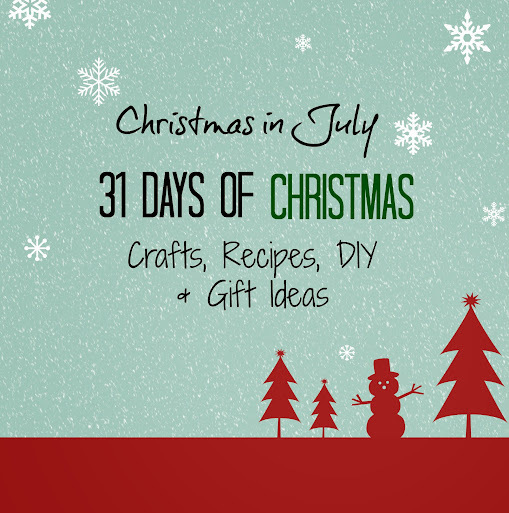 What is your favorite inexpensive DIY Christmas gifts to make? Such a fun gift for foodie friends! Pinning this to my Christmas board! I love the whisk idea. I am going to do gifts for my church families and this will work perfectly thank you and may GOD BLESS you. 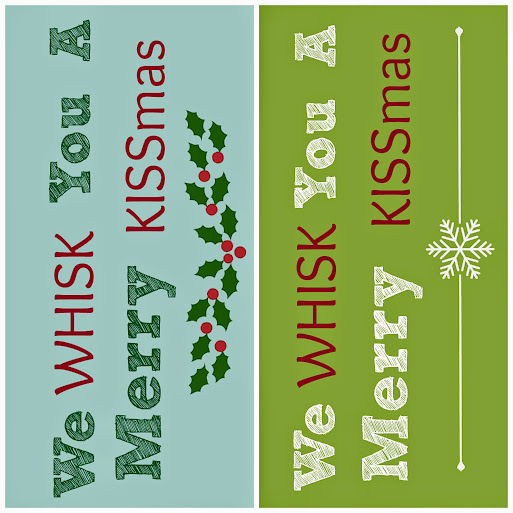 “We WHISK you a merry KISSmas” is perfect the way it is. This idea is just perfect to give someone that has everything. It would be just just a little something to say Merry Christmas. of give to a Host of a Christmas party you have been invited too. I really like this idea. When I click on the image for a printable copy it won’t let me print it. I am in the process of making these and need to know how to print the tie-ons.